This is an ideal class to begin your figure drawing studies or to deepen your understanding and increase your ability to depict the human figure! In this class we will be studying the human form from life using charcoal and Conté. Depending on students’ needs we will be covering anatomy, light and shadow, warm and cool tones, texture, creating mood, likeness, and energy in our drawings. We will be working from quick studies to more completed drawings. If you have drawn only in pencil, this is an excellent introduction to other drawing materials and their uses. Make your figure drawings come alive with these traditional materials, used to create strong or delicate lines, subtle or dramatic shading, and expressive portrayals. Do you feel the need to improve your observational skills to enhance your paintings? Do you need to know more about how to plan your paintings? Do you want to be able to bring your own style to paintings? Whatever your painting medium, there are skills you need to have in order to go from good to great painting! In this weekend class you can use your choice of oil, acrylic, watercolour, or gouache to learn about painting through observing floral still lifes. This class is excellent to study the technical side of creating a painting while also learning to interpret what you see in order to create a great work of art. We will explore colour, value, composition, paint application methods, and understanding what we see. What we explore in this workshop can be used for painting all subjects. Our goal is to help you gain the knowledge you need to further you painting skills and gain confidence to build on your own personal painting practices. This class series is designed to promote exploration, discovery, and recording ideas. We will be dabbling in different genres and subject matter. We will create work in our sketchbooks as we research such things as still life, abstraction, the human figure, portraiture, illustration, landscape, interiors, cityscape, etc. We will look at how to put ideas together and how to work through ideas whether they are based on emotions, politics, morals, specific or general messages, and more. In this class everyone's work will be distinctly different and determined by each student’s own tendencies and interests. 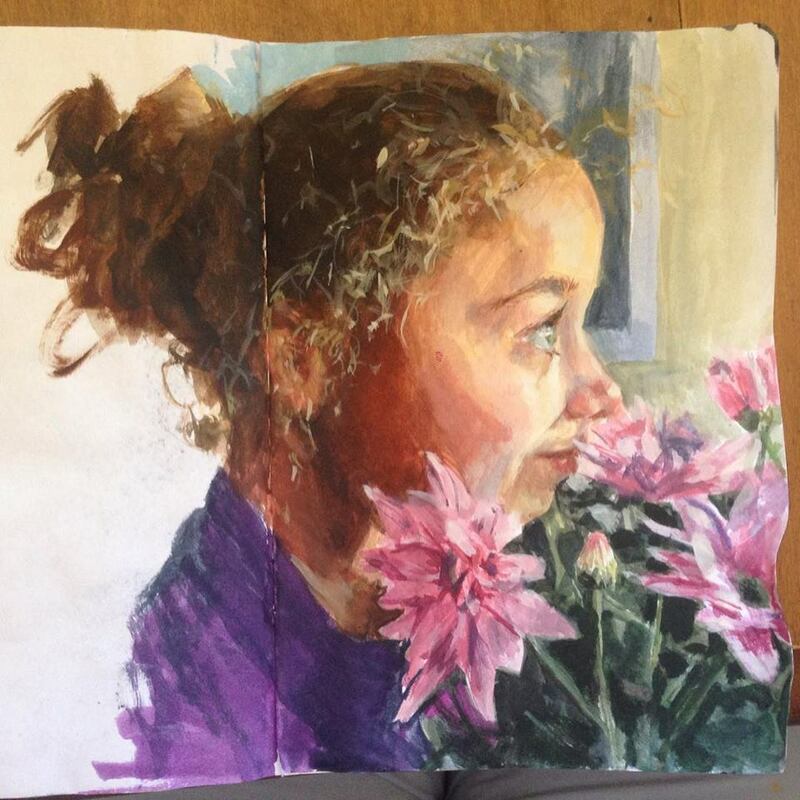 We will do all this in gouache, which is an amazing medium to use in a sketchbook as it has many similarities to oii, acrylic, and watercolour painting all combined in a quick-drying and easily portable way. This is a great class series to cultivate ideas to start a body of work or to further one’s own current painting practice in any medium. You will find many uses for your gouache! It is also a great medium for traveling artists. to improving your portrait painting skills. We will cover general topics in portraiture as well as concentrating on the particularities of our models. We will be working from live clothed models, focusing on creating likeness. personality. We will also cover light and shadow, hair, and clothing. You can apply the skills you learn in this class to all your portraiture in fact your new knowledge and ability will show in all your painting! 2 classes each drawing, charcoal & painting.